With a sculpted body that fits right-handed persons perfectly, the new M705 wireless mouse from Logitech is specifically designed for laptop users. It also comes with a 1000 dpi sensor and the Unifying Receiver. Getting a good wireless mouse for your laptop might not prove to be a big challenge, that’s until you realize any batteries get drained in just a couple of months, when the original batteries lasted for half a year. Logitech has got you covered with the new Marathon M705 wireless mouse that lasts for 3 years on its original 2 AA batteries, so you can just forget about recharging it. Apart from that extra-long battery life, the Marathon M705 features the new Unifying Receiver from Logitech that allows users to add supported devices like gaming keyboards and advanced mice without installing any special drivers. Another feature specifically tailored for laptop users is the hyper-fast scrolling wheel that can scroll horizontally as well. Logitech included a 1000 dpi sensor that can process 20 inches per second. 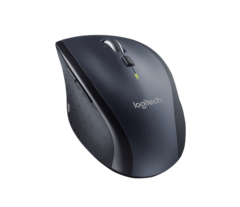 All eight buttons can be programmed, and Logitech ensures that the mouse is operational within 32 feet. The mouse features a sculpted design that guides the hand to adopt a natural position, but it is for right-handed persons only. The M705 is available at Amazon for as low as $33.75. Pixel 2 XL screen prone to burn in?